Ginga Eiyuu Densetsu: Waga Yuku wa Hoshi no Taikai (銀河英雄伝説 わが征くは星の大海, Ginga Eiyuu Densetsu: Waga Yuku wa Hoshi no Taikai? lit. 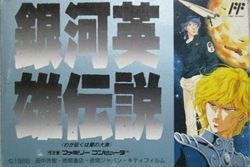 Legend of Galactic Heroes: My Conquest is the Sea of Stars) is a strategy game developed by Tokuma Shoten for the Famicom, and published in Japan by Kemco near the end of 1988. It is based on the anime series known as Ginga Eiyuu Densetsu, or Legend of Galactic Heroes in the west, which itself is based on a series of science fiction novels written by Yoshiki Tanaka. Specifically, it is based on the movie subtitled Waga Yuku wa Hoshi no Taikai (My Conquest is the Sea of Stars), the first animated adaptation of the series of novels, which was released earlier in 1988. The film serves as a prequel to the main OVA series that followed only months later, and chronicles the first encounter — in combat — between Reinhard von Müsel (who later adopted the Lohengramm name) and Yang Wen-li, the two primary protagonists of the LOGH series. In the game, the player controls a fleet of starships. The goal of the game is to direct the various commanders of the player character's fleet by giving them specific orders. Eventually, the player will be required to direct massive battles between their fleet and the rival empire's. A Famicom midi variant of the classical music piece Bolero by Ravel plays throughout, lending the game a suitably operatic feel. This page was last edited on 2 March 2016, at 02:58.